The Media Facades Festival Europe 2010 is co-organised by Medialab-Prado and curated by Nerea Calvillo. Medialab-Prado and Nerea Calvillo contribute artists’ projects to the Joint Broadcasting Events and are responsible for the implementation of the programme in Madrid. Medialab-Prado is a programme of the Department of Arts of the City Council of Madrid, aimed at the production, research, and dissemination of digital culture and of the area where art, science, technology, and society intersect. Medialab-Prado offers five flagship programmes: Interactivos, Data Visualization, Inclusiva-net, Commons Lab and AVLAB. is a research and production platform for the creative and educational uses of technology. Its main goal is to expand on the use of electronic and software tools for artists, designers and educators, thus contributing to the development of local communities of cultural producers in this field. Interactivos events are a hybrid between a production workshop, a seminar and a showcase. A space for reflection, research, and collaborative work is created, in which proposals selected by an international open call are developed, completed and displayed. The process is open to the public from beginning to end. is a transversal discipline, which harnesses the immense power of visual communication in order to explain, in an understandable manner, the relationships of meaning, cause and dependency which can be found among the great abstract masses of information generated by scientific and social processes. The Visualizar project, directed by José Luis de Vicente, is conceived as an open and participatory research project around theory, tools and strategies of information visualisation. is a platform dedicated to the research, documentation, and circulation of network culture theory. Its main study and documentation areas are the processes of social and cultural inclusion of telecommunication networks and their effects in the development of new artistic practices and critical knowledge production. brings together people from various fields including philosophy, ecology, hacktivism, law, urban planning, art, journalism and economic policy. ‚Procomún’ (Commons) is a new term that seeks to express a very old idea: that some assets belong to everyone and together they form a community of resources that should be actively protected and managed. That community consists of the things we inherit or create jointly and hope to leave to future generations. 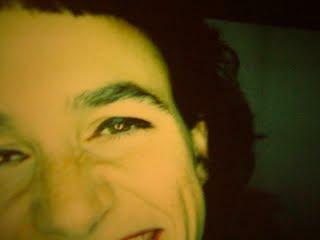 is a meeting platform for the creation and distribution of sound and visual arts from an open collaborative approach. 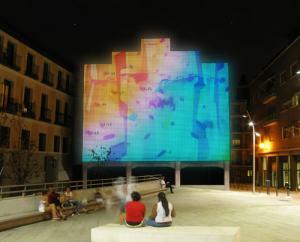 Nerea Calvillo is an architect, specialized in new technologies as design tools. She has been researching and designing media facades through exhibitions and competitions since 2002. Also, her research projects focused on data visualization and carthographies have been developed in many international universities and new technologies centers, including her recent project In the Air at Medialab-Prado. She is now directing the line of research related to the screen Media(nera)Lab.